Hi! My name is Chelsea Mellonas! I was born and raised in Raleigh, NC. I am a wife to my loving husband Patrick and new mom to our son Theodore born in December of 2017. My love for Disney runs deep! My family has been going to Disney for longer than I can remember. One of my favorite memories of those trips is my dad always wearing his sunglasses on Splash Mountain because he didn’t want us kids knowing he had his eyes closed on the big drop! Disney has always been my happy place and I love sharing that magic with others! 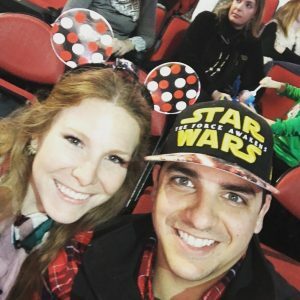 I take full responsibility for turning my husband into a Disney lover as well. When we first met, he had never been to Walt Disney World. I planned a trip for us the first year we were dating and he has been hooked ever since. We have gone together every year since that first trip! No matter how many times you have visited a Disney park or resort there is always something new to experience and new memories to be made. Whether you are a first-time visitor or a seasoned Disney vet, I would love to help make your Disney vacation dreams a reality. No matter what type of vacation you are planning, a big family gathering, a romantic couple’s getaway or a fun girls weekend, I can help make your travels as easy and stress free as possible. Whichever Disney destination you choose, my job is to ensure your trip is everything you want it to be! I will handle all the details so you can just sit back and enjoy your vacation! I look forward to helping bring the Disney magic to your family!